Vacations, getaways, holidays — they are all meant for relaxation. For some adventurous souls, that means a tent, backpack and the solitude of alpine wilderness. For others, that means taking it easy, maybe even a good pampering. 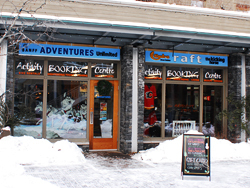 Fortunately for both kinds of people, Western Canada’s Banff National Park and the town of Banff, Alberta offer options for both kinds of people. Featuring an historic spa and bath house fed by natural hot springs, the Banff Upper Hot Springs offer all the luxury and amenities of a modern spa, including therapeutic massage. And seeing as they are just few kilometers from the town of Banff, they are set against a backdrop of spectacular Canadian Rockies alpine scenery. You can relax in the comfort of soothing hot water – while letting your eyes rest on majestic, snow-covered peaks and wooded valleys — where travelers have come for more than a century to enjoy the 1930s-era bathhouse and the outdoor, spring-fed hot pool. 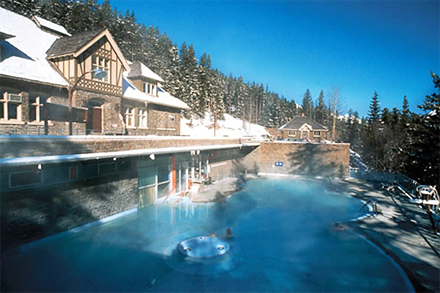 The Banff Upper Hot Springs also have a day spa that offers a variety massage therapies, steam room, aromatherapy, and wellness treatments. The Hot Springs are open year around with extended hours during peak seasons. And the Upper Hot Springs are certainly not the only hot springs in Banff National Park.